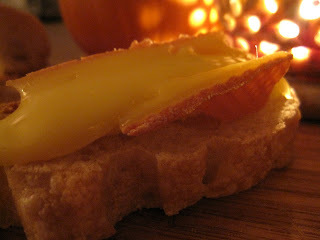 I know, I know, you’re wondering about the perfect Halloween cheese. 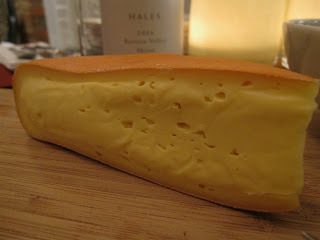 Okay, that pushes us into orange territory…but I feel strongly that a Hallow’s Eve cheese should be stinky. I mean, if it doesn’t smell foul it won’t fit in with the bloody stump you’ve got sitting on the hay bale by your stoop. Who wants to linger in a witch costume eating something as mousy as a Colby? I, for one, will be reaching in amid the dry ice for a wedge of Grayson, an oozy washed-rind cheese with a surface that is crossing-guard orange. This is a pungent, dearly gooey cheese that comes from Virgina (kind of a scary place). Think of an Italian Taleggio, then add a muscle shirt. Grayson is produced by Meadow Creek Dairy, a family farm that practices seasonal grazing – the color of the cheese is actually from the high levels of bete ceratene in the milk. 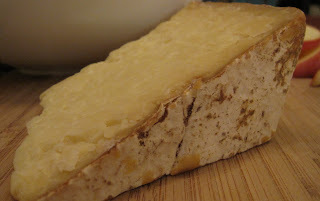 This year, Grayson won 2nd place for Washed Rinds in the American Cheese Society Awards. It has also garnered media kisses from Marty Stewart. For stinky-cheese novices, here are some suggestions: serve this oozy wedge alongside honey and dried fruit, and know that once this cheese sits out a bit the dirty-sock odor will subside. The smell is most concentrated when you first unwrap it. The folks at Meadow Creek recommend serving this raw milk cheese with a full-bodied white, a light red, or a dessert wine. Personally, I like the idea of a strapping Belgian ale -- something to match the complex beefiness -- and a dish of salted almonds. I plan to serve it toasted, on baguette rounds, come Halloween. This year I might just serve all the little neighborhood ghouls a hot cheese appetizer instead of candy. Why the hell not? Hell, I couldn’t wait to fire up the toaster oven tonight when I got home from a rainy day at work. I took the crust, sliced it right onto a baguette round, and, oh, what a melty treat I had. Even the dog was licking her lips. Truth be told: I took this cheese to a little soiree last night hosted by our very persnickety Euro cheese friend, The Blue Cheese Brit -- a regular character in these posts. Being British, the BCB likes to stick his rosy nose up at domestic cheddars. So, I was pretty excited to watch his reaction when I slid my wedge of PA Noble – made of organic, raw milk from grass-fed cows – onto his cutting board. PA Noble comes out of Green Valley Dairy in Lancaster County, where it was developed by a pair of Amish brothers keen to switch from hormone-amped cows to pasture-raised heifers. Now their cave-aged cheddar-style Noble (as they market it) is a hot ticket item. It’s won several national and local awards, and you’ll find it at ritzy bistros, like Django. 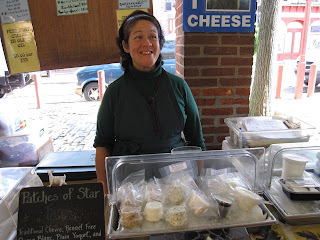 I heard about it at the Fair Food Farm Stand in Reading Terminal Market, my fave source for local cheese. PA Noble is marvelously sharp. It has the tangy claws of a cheddar, but it’s earthier…pasturey. The mouthfeel is smooth, though Noble is crumbly, and the sharp tweak at the end actually leaves your tongue a bit numb. The label (which pictures a goofy cow in an Amish hat) should be obeyed: toast those rinds. It makes for a crisp-gooey, grandfather-ish snack. And if you’re ever invited by a British snob to a cheddar smack-down, this is just the eyebrow-raiser you’ll want to slide out of your back pocket. If there was a cheese-of-the-woods mushroom, this would be it. Bleu Mont Dairy’s Bandaged Cheddar Reserve tastes like walking through a damp forest in October. It’s gorgeous – a cheddar so woodsy you have to wear a wool sweater to eat it and, if possible, a cap with ear flaps. Bleu Mont Dairy has an interesting story. I used to buy this cheese from Willi Lehner at the farmer’s market in Madison, Wisconsin, and I never knew his cheese-making operation was solar and wind-powered. Or that he had a straw-bale aging cave. Uhm, I want to live there. It sounds like one big Michael Pollan fantastique. Bleu Mont’s Bandaged Cheddar is…how shall I put this...for mature audiences, much like Lars von Trier’s latest -- which is worth seeing if you like talking taxidermy. I do. If you want to host a cheese-cap after the movie, this would be an ideal centerpiece. I mean, it is bandaged. Break out the hard cider – Strongbow pairs nicely – then put on some theremin records. This curiously gamey and strikingly elegant raw-milk cheese will have you dreaming of dark branches, wet wind, and talking foxes. I’ve been on a cheddar kick lately, which is why I did a little polka yesterday when I received a block of this pungent raw-milk cheese in my CSA box from Greensgrow Farm. Greensgrow, a mostly organic urban farm up here in Fishtown, is probably my favorite discovery since moving to Philadelphia. Located on the site of a former galvanized steel plant, this wee bit of acreage out here amid the asphalt jungle makes me feel like I’ve got one foot back in the Midwest. With a city block full of raised beds and a nursery that stocks heirloom plants, Greensgrow has become my personal and spiritual pantry. Now that I’ve joined their CSA – Community Supported Agriculture – it’s become the center of my universe. I stop by the farm every Saturday and pick up my weekly ration of local produce and dairy, then I kiss the ground. I smooch the earth, I really do. Are you scratching your head? Are you working the toothpick over your teeth and wondering what in heaven I’m talking about? I know, cheese dreamers, you never thought you’d see the words “urban” and “farm” linked together. But believe me, the people at Greensgrow have given me faith that good things can come from concrete. They are even teaching rowhouse-dwellers like me how to compost in Dixie Cups (well, not quite) and how to keep bees in the city. It won’t be long before I am making cheese from itty-bitty city goats on my rooftop. Until then, I’ll just enjoy local cheeses that come to me through the refrigerator case at Greensgrow – there’s a whole cooler stocked with local meats and dairy treasure. This week’s Friendly Smoked Cheddar is just that: frrriendly. It tastes good with everything. On Saturday, I served it alongside beans on toast for a traditional (but vegetarian) British breakfast – it was a perfect substitute for sausage links. I couldn't find out much about this smoked cheese, except that it's produced by a farm cooperative in Gap, Pa. It's available locally at Weaver's Way Co-op, Pumpkin Market, and Greensgrow Farm. If you stop by Greensgrow, be sure to raid the cooler for a few other worthwhile dairy specialties, including Pequea Valley Yogurt (vanilla is my favorite) and the goatmilk gelato made by Gelati di Capri (try the Mandarin Cremesicle). Pssst...Greensgrow offers a winter CSA that's incredible -- the highlight of last winter, for me. There are a limited number of shares, and sign-up just started this week. I have always liked mold. Still, I was a little unprepared for the gray furze on the surface of Bloomin’ Idiot, a new cave-aged blue from Hook’s, a company that I think of as the Prada of Wisconsin blues. I unwrapped the package, then went online to the Hook’s web site to make sure I hadn’t let my little bitta luv sit in the crisper for too long. Nope. This cheese is supposed to look like the moon. “Bloomy” cheeses are usually white, at least in my experience. Think brie. Think camembert. They look like leather purses. You can eat the rind (I usually do), but if you’re mold-averse, you can cut the crust and dig into the center. Bloomy cheeses ripen from the outside in – instead of injecting mold into the cheese itself, cheesemakers spray or rub mold spores onto the surface, then let the wheel age. The resulting cheese is strong around the edges and mellow within, kinda like a Philadelphian. I’d never encountered a bloomy blue until last night, when I stared down Bloomin’ Idiot on my kitchen counter. I wanted to put on some boxing gloves. I mean, this wedge looked tough. I let it breathe, put on a little Billie Holiday (“Am I Blue” seemed appropriate), then read a blurb about Patti Smith in the New Yorker which mentioned both Prada and “punk chanteuse” in the same sentence -- delightful. I hoped my bloomy cheese would be a punk chanteuse. Bloomin’ Idiot tastes barnyardy with a sharp blue kick at the end. It brought to mind tractor pulls, where there is often a lot of dust and pollen in the air, alongside the smell of hot rubber. The sharp taste at the end reminds me of that rubber smell, although that’s not a bad thing. The mouthfeel is creamy, and because there are small holes in this ivory dream, I thought of baby swiss. If I had been blindfolded, I couldn’t have told you this was a blue cheese. It’s definitely one of the more unusual blues I’ve tasted. The cantankerous purist in me was skeptical, but the punk chanteuse definitely dug it. Last night, I also broke out a wedge of Dunbarton Blue, another new and unusual blue from Wisconsin, this one from Roelli Cheese Haus, in Shullsburg. This is a great pairing if you want to peruse the Roquefort periphery, because although these two cheeses sing bluesy notes, they definitely rock out with their own sweet solos. 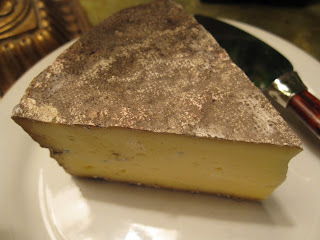 The Dunbarton is cheddary with a blue warble; it’s a firmer, more charismatic cheese than Bloomin’ Idiot. The longer I let Bloomin’ Idiot sit, though, the sweeter and softer it became. Mmm...smarvelous. Full Disclosure: Both of these cheeses were mailed to me as samples from the Wisconsin Milk Marketing Board. It’s all cheese and apples at our house these days. Tonight, my man Tij and I were hankering for a pizza, so why not a pizza with cheese and apples? Why be shy and pretend we don’t love a pizza that’s a wee bit like apple pie? Lucky for me, a Poe scholar at work gave me his pizza recipe this afternoon – so I was ready to knead while Tij read “The Raven.” On a whisper-cool night, this was perfect. Caw caw. We thought of Scholar Fusco as we sliced heart-shaped apple slices and tried not to grate our knuckles as we readied the cheese. I had a puck of Farmer John’s Gouda in the crisper, another bit of fortune. When I lived in Wisconsin, I used to buy cheese from Farmer John at the Dane County Farmers’ Market – good stuff. 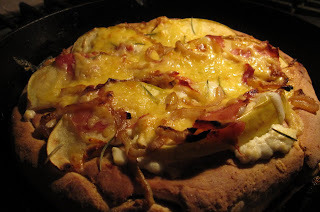 Although you can use any gouda to top your pizza (recipe below), I like the understated taste of Farmer John’s – it’s a young gouda, and it’s texture is very smooth. 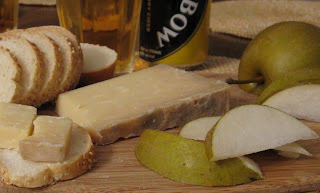 The taste is vaguely cheddar-like with a sweet-sour note that goes nicely with tart green apples. We make our pizzas in a 12-inch skillet, which crisps the crust. Dr. Fusco and Farmer John did right by us; this was an excellent pie, probably the best we’ve ever made. Using a standard mixer, combine water, yeast, sugar, salt, and olive oil. Measure the flours into a separate bowl, then add 1 ½ cup of the flour mixture to the yeast mixture. If you’ve got a dough hook handy, get it ready; otherwise use a wooden spoon to stir in the remaining flour a heaping spoonful at a time. Knead for 5 minutes. Put the dough in a lightly oiled bowl. Turn to coat with oil. Cover bowl with plastic wrap and place in a warm spot for one hour, or until dough has doubled in size. Then punch the dough down and divide it in half. You’ll make two pies. While your dough is rising, caramelize onion: heat the skillet over a medium flame and add 1 Tbs. of oil, then add sliced onions. Turn the heat to low after five minutes, and go play a round of rummy. Turn onions occasionally until they are tender. Then add 1 Tbs. of balsamic and a sprinkle of brown sugar. Stir, then turn off the heat. You’ve got gorgeous onions. Put them in a bowl. When the dough is ready to go, crank the oven to 500 degrees. Put the skillet in the oven while it warms. When the oven is done preheating, pull the skillet out, drizzle some olive oil around the bottom, and press half of your pizza dough into it so that you’ve got a funny little patted-down pizza crust that reaches the sides. Bake this for 10 minutes. Play another hand of rummy. Drizzle a little oil on the pizza dough when it comes out. Spread it around with the back of a spoon, then lather on the ricotta. Add apple slices, caramelized onions, torn bits of Pancetta, a few needles of rosemary, and finally the Gouda. Turn the oven down to 425 degrees, and bake the pizza for 15 minutes, or until the cheese is really bubbly. Let sit for 5 minutes before cutting. Lately, I’ve been on a quest for the perfect desk cheese. That’s right, a cheese I can eat at work when I’m lunching avec email. It has to go with apples and pretzels, or whatever’s handy, and it can't be a cheese that stinks up the wine fridge under my printer cart. Mmmm, yes, I do have a wine fridge at work...for keeping cheese just the right temperature, of course. So, here’s my star: Carr Valley’s Menage. It's a Spanish-style cheese that I think is, well, perfect for the office lunch. It’s not only fun to mention in passing ("yes, just having a little Menage at my desk"), but it’s fun to taste because you can actually taste all three milks: cow, goat, and sheep. If you’re at your desk, close your eyes. Imagine a mild white cheddar mixed with Manchego. You can smell the sheepiness, but it’s not overpowering, and there’s very little goaty tang. Still, it’s well balanced. Alongside an apple, it’s quite nice, especially as the breeze coming through the office window rumples your hair, oh…where was I? If you find Menage too distracting at work, serve it at home. 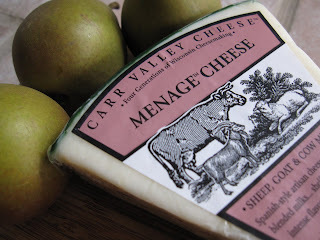 Sid Cook over at Carr Valley in LaValle, WI recommends serving it with Guinness (or a Shiraz) – which sounds like one more indecent thing to dream about. One last suggestion: as long as we’re talking about how to improve desk lunches, check out the cool, waste-free lunch kits put out by Kids Konserve, a company specializing in eco-friendly sandwich kozys. They're the latest thing I'm coveting. Note the insulated totes with non-toxic ice packs -- ideal for carrying cheese to work, non? It’s a rainy morning, cool, the smell of damp earth in the air. It reminds me of my recent trip to New York state, to visit the farm of my friends Heather and Jesse. When I went for a walk one morning in my pajamas, there was frost on the grass, and the air smelled of sweet hay. In the distance, I could see deer nibbling the high weeds, and there was fog, a beautiful fog, rolling across the valley below Heather and Jesse’s house. I’m reminded of that morning whenever I open the crisper and see the red package of Lively Run feta I brought home from that trip. The taste of that feta is still amazing to me – it’s crisp, almost bracing, and the flavor palate runs from grassy to lemony. It’s like a morning meadow inside a cheese. Yes, you can taste fog. I feel like I can even taste frost on the grass. What to do with that last hunk of New York feta? I’m defrosting some pesto this minute, and I’m envisioning a Lively Run Goat Cheese pizza – there’s a recipe posted on the Lively Run web site. I’ll admit, I like a creamier goat cheese; this one is dry, not ideal for a salad, in my opinion, but I think on a pizza it will lend just the right murmur of dew to spring my pesto to life. When I sit down to supper, I will think of my friends Heather and Jesse, who made a courageous move across the country from Wisconsin to New York, arriving Joad-family style, with a trailer full of chickens. Their beautiful farm is my reminder that, while city life is grand, the greatest pleasures come from observing nature: a shaft of sunlight seeping through a barn window, an orange cat sleeping in a barrel of hay, a brood of chickens clucking to themselves all day long – as if reciting short, quick poems.